Bravery comes in all different ways. Sometimes it is silent and not always known. I say this because our beloved President, Michael Simpson, who is the bravest man I know, is stepping down from the Presidency due to health issues. It was a hard decision for him and our thoughts and prayers go out to him and his family. The good news is that he will continue taking care of our website and work on Mighty D8a when he can. Mike, you will be missed and know that we will be here for you. The Executive Board selected a committee to look for a new President. I volunteered to be Acting President until our next election in 2019. I am honored to take the position along with my Membership duties. The 2018 Heritage League Convention in Dayton, October 10th through October 14th was a success. 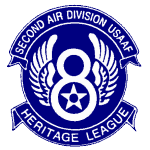 As last year, we again joined with the 8th Air Force Historical Society. We are very excited that our 2019 Heritage League Convention will be in Norwich, England–June 9th through June 14th. We ask that, if you are interested, please send in the deposit form as soon as possible so we can get a count. It will be a trip of a lifetime! Our lives are filled with busy moments and events. Take some time to remember a Veteran and thank them for their service. It will mean the world to them.